Spiralizing seems to be all the rage the moment. There are dozens of Pinterest boards dedicated to spiralized recipes, numerous blogs and website articles telling you how to get the most out of your spiralizer and Sainsburys are selling courgetti and butternut squash noodles. Steamer trading cookshop sent me a Gefu spirelli spiral slicer so I could create my own spiralized recipe. I was originally going to make a spiralized salad, but I fancied trying something a little different. The night before I received the slicer I had made some shortcrust pastry for a quiche. I started to think about incorporating the spiralised veg in the quiche, but I wasn’t sure if it would work. My initial concern was that the thinly sliced veg would catch in the oven and burn or end up overcooked. There’s only one way to find out, I told myself! It actually worked really well – the veg was perfectly cooked through, with no mushiness at all. The Gefu spiral slicer did a great job of spiralising the courgette and sweet potato. The extremely sharp Japanese blades sliced through the veg super fast. But what I really love about this spiralizer is how easy it is to clean. All it needs is a quick rinse under the tap. It doesn’t take up much room either, which is perfect if you’re like me and don’t have much space left for new kitchen gadgets! There are 2 settings which creates 2mm or 3.5mm spirals. Compact, simple to use and easy to clean – the Gefu spiral slicer would be a great purchase if you are interested in buying a spiralizer but don’t want a huge gadget taking up space on your work top. The courgette fit perfectly inside the slicer but I had to cut the sweet potato which left me with a few odd pieces leftover – they won’t be wasted though, they are in the fridge destined for soup! The nutmeg in the filling is crucial for flavour – it makes all the difference. Place the flour in a large mixing bowl. Add the butter and parmesan and rub in until the mixture resembles breadcrumbs. Add the egg yolk and 1tsp water and mix until you have a dough. If the mixture isn’t forming together, add a little more water, a few drops at a time. Cover the dough with cling film and leave to rest for at least 30 minutes. Preheat the oven to 180/350F/gas mark 4. Place a baking tray in the oven to heat up. Roll out your pastry on a floured surface to fit a tart tin. Place a circle of baking paper over the pastry in the tin and fill with baking beans. I don’t have baking beans – I use pasta, dried butter beans or anything similar. Just one word of advice – don’t use lentils! I did once and I ended up with crunchy lentils in my cooked pastry. There was a slight tear in the baking paper I used to line the tin and they ended up embedded in the pastry! Not great. Place the pastry lined tin in the oven and bake for 20-25 minutes or until cooked through and the edges are golden brown. Melt the oil and butter in a frying pan. Add the onions, sprinkle over the sugar and cook over a low heat for 10-15 minutes until the onions are very soft and caramelised. Remove the onions from the pan and set aside. Spiralize the sweet potato and courgette. Place the onions in the pastry case and place the spinach on top. Add your spiralized veg, spreading it all out so you have an even covering. Beat together the eggs, cream, salt and pepper, nutmeg and thyme. Pour this mixture into your pastry case, going slowly to allow the mixture to sink in. Try and make sure the spinach is covered or it will catch in the oven. Carefully transfer the quiche to the oven, placing on the preheated baking tray. Bake for 50 minutes or until the filling is set. I was sent a Gefu spiral slicer for review. I was not paid in cash for this review. All opinions and photographs are my own. The Gefu spiral slicer is available to buy online here at Steamer trading cookshop. 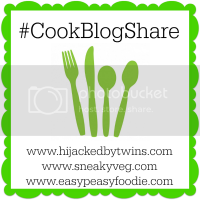 I shared this post over at Taming Twins for #CookBlogShare.